This current post was inspired by my own earlier desert survival posts. What I realized in the process of writing was that living in a particular place is not really survival. The term survival implies that one lives in spite of various hardships. I don't really think that Indians who lived in the deserts of the US southwest were merely surviving. I think that for the most part, they were living comfortably. Surviving is what you end up doing when you don't know what you're doing. So toward that end, I thought I'd look at some of the books on my shelf that dealt with how the Indians made a living, where they got their food and how they prepared it. Theoretically, if one reads these kinds of books, one might figure out how to live in the wild. So let's look at the books. Survival Arts of the Primitive Paiutes is really a pretty good book in spite of the overly dramatic title. I guess this kind of title grabs more attention than Natural Economy of the Pre-industrial Paiutes. 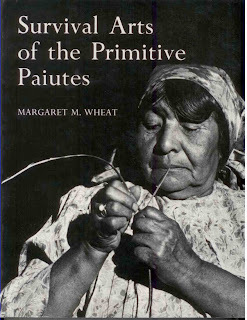 The book tells us, among other things that the Paiutes had multiple tribes and that each tribe tended to be named after their main food source, for instance Trout Eaters or Cattail eaters. Today we would call them locavores, people who eat only locally grown food. But back then, everyone was a locavore by necessity. One important fact that comes out of this book is that availability of food was seasonal. Pine nuts appeared in the fall. Cattails were at their best in the spring. Fish came out of the lakes and ran up streams to spawn the same time each year. And there were lean times like the dead of winter when people ate what they had stored. What is apparent when you read this book is that one cannot simply walk into a wild region and expect to find food any time of year. The Paiutes, like any moderns society needed to store food to survive the lean times of year. Even the ground squirrels and wood rats and birds had to store food against the lean times. The book also has a chapters on various Paiute technologies such as the construction of traps, the processing of food, making of cordage and nets, the building of tule reed boats and more. While these descriptions probably leave a few things out, they are detailed enough that someone wanting to replicate the Paiute technologies would at least have a place to start. 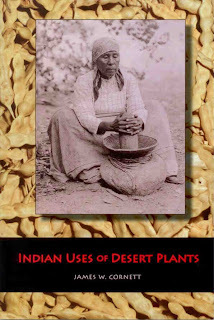 Indian Uses of Desert Plants is a survey of plants most commonly used by Indians of the Mojave and Sonoran deserts. Several things stand out. One is that the plants in this book are all fairly common. They are all plants you will have seen even during a casual stroll around the perimeter of a road side or from the edge of a hiking trail. While deserts will have small micro-environments around springs and water courses, by and large, the number of different plants growing in the predominantly dry areas isn't large so that even a casual observer can quickly learn all the main plants. 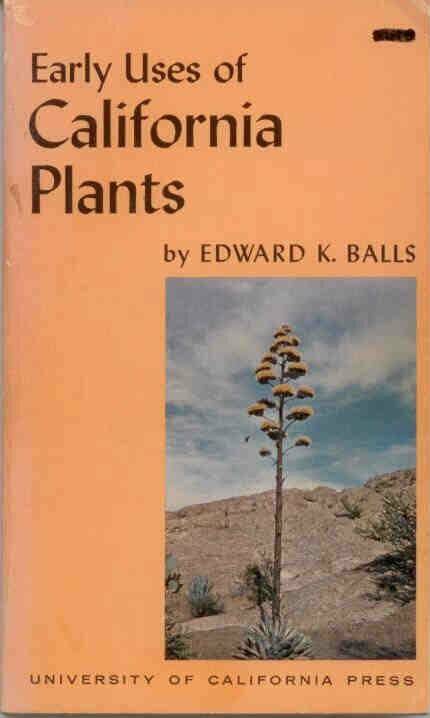 What struck me about this book was that just about all the plants one commonly sees in the desert seemed to be listed in this book. 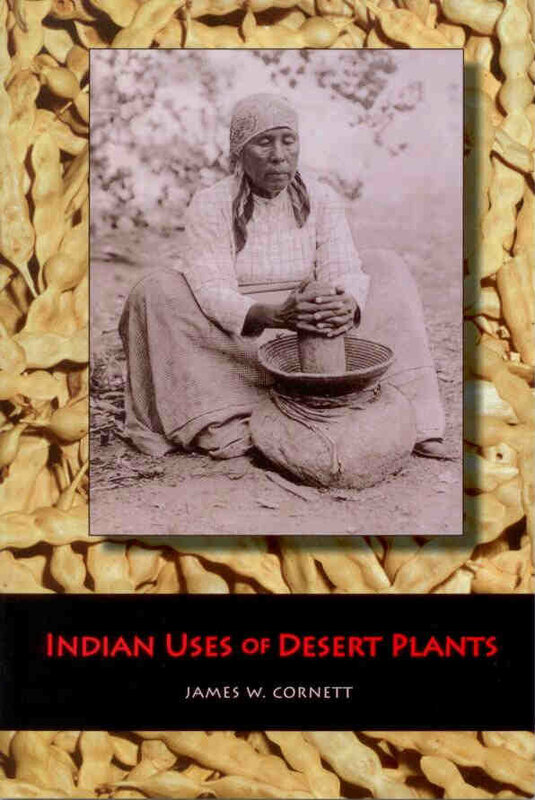 It appears that there was hardly a plant in the desert that wasn't used by the Indians for something or other. Every plant in the desert, even the most insignificant looking ones were good for something, tools, food or medicine. While this book does a good job of listing plant uses, it is only a survey book and not a how to book. You won't find recipes here for mesquite bean soup, only the fact that the Indians ground mesquite beans into a meal and ate it in various forms. This is a book similar to the book about the Paiutes and even has a similar sounding title, only it is more detailed and three times as fat as the Paiute book. The focus of this book is more on various technologies of the California Indians than the foods that they ate. But even with its 448 pages, a book like this can only be a survey, at best, or selectively detailed since California probably encompasses more bioregions and Indian tribes than any other state in the US. In any case, while this book cannot do justice to all the Indian technologies of California, it does do a good job of covering those that it does focus on. Bow and arrow making, pottery, weaving and traps are covered in good detail. This book is highly recommended for anyone interested in Native technologies. 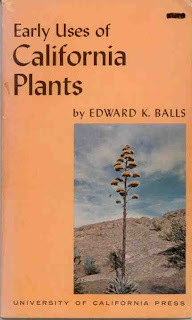 Early Uses of California Plants is a small book and avoids an overly dramatic title like some of the others reviewed here, but is thorough and detailed in what it does cover. It only addresses plants, gives a picture of each for identification, along with some color plates bound into the center of the book and describes each plant in detail. My favorite entry was on acorns, perhaps the most important food for California Indians in the regions where the oaks grew. We are told that a family in Mendocino county would collect as much as 500 pounds of acorns in a year. The book covers food plants as well as medicinal plants. Details on medicinal plant use are generally slim other than to mention that they were used for certain conditions. I guess you can't expect to become a medicine woman or man by reading a 104 page book. Still, lots of good info in a small package. Before California is about history and archaeology of the state of California before it became the modern political entity that it is today. 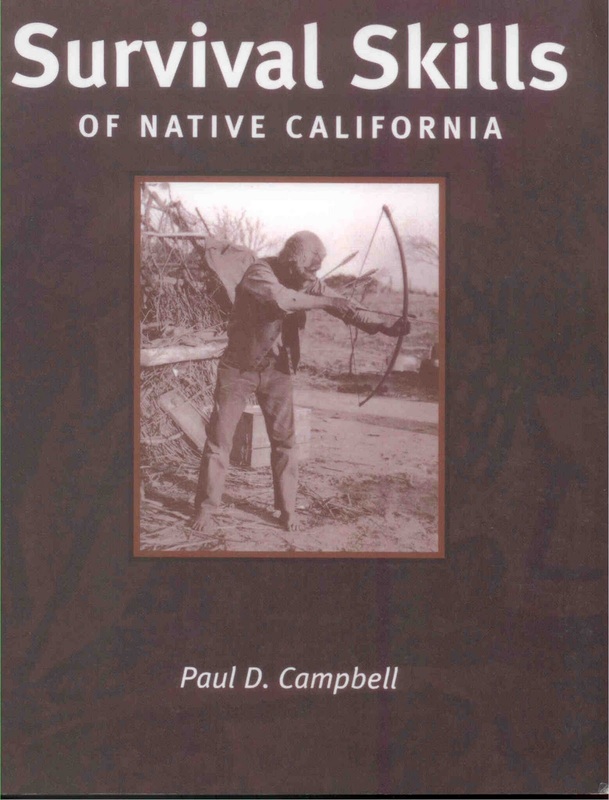 The book isn't primarily about food and technology of California Indians but does provide some good perspective on how lifestyles of California residents changed over the millennia. I personally had always thought of the human past as having had two distinct phases, the historical past where humans invented civilization and the time before that. The time before civilization always seemed to be invariant for thousands of years on end. 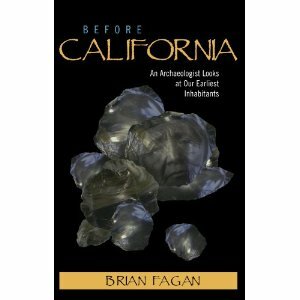 But if you look at a narrow region like California as Brian Fagan does, then you discover that the climate and population density of the region varied greatly over the time that people first appeared on the scene about 10,000 years ago. Perhaps not surprisingly, people first entering California ate all the best stuff first and ate the less desirable stuff only after the best stuff was gone. We now think that the main food of the Central California Indians was the acorn, but Fagan tells us that this wasn't so. Acorn processing only started some 1000 years ago. Acorn processing takes quite a bit of work and although California Indians knew about it for longer than 1000 years, they didn't bother eating acorns because there was enough stuff around that took less work to collect and process, like grass seeds. Do Californians eat acorns now? No, they've stopped because it's easier to buy food that somebody else made.